By Janet McNally, Hinckley, Minnesota — At this writing I am smack dab in the middle of lambing, so please forgive me if I’m having a difficult time writing about any other subject. I had planned to finish a second article on crossbreeding, and will get to that in the next issue, but I would like to address lambing while it is fresh on my mind. The subject here is bonding, which is of tremendous importance to lamb survival in pasture lambing programs where there are no pens to keep newborns with their mothers. The bonding process occurs from birth through the first few days of life. The dam may reject her lamb if they are separated for as little as 30 minutes after birth. The more lambs in each litter, the more important it is that all of them remain with the ewe at all times. When everything is working well, each ewe picks a secluded part of the pasture hours before she delivers. She will defend that piece of turf for up to 30 feet around, not permitting any other ewes or lambs near. After delivery, she will remain at that location for anywhere from a few hours to as much as a day or two, depending upon how many lambs she delivered and the environmental conditions. The longer she stays, the stronger the bonds between the dam and her lambs. Equally important is that the lambs bond to each other so that they stay together. Our job as shepherds is to provide the best opportunity for that ewe to remain undisturbed so she has no reason to leave her chosen spot. This entails managing the grass to assure that she has enough to eat within 30 feet of where she lambed, along with managing the weather. Of course we cannot manage the weather, but we can choose a first-lambing date that on average provides the best conditions for safe lambing and strong bonding. This time is not too cold, not too hot, and not too buggy. While it is difficult to come up with a perfect guideline for all parts of the country, the optimal time for survival seems to be when air and soil temperatures average 50 degrees Fahrenheit. In the Midwest this corresponds to corn planting time. Another guide is to start lambing about three weeks after the brush has budded out. With the correct date, there will be enough grass underfoot to feed the entire flock without supplement, there will be very few bugs, and the need for water will be minimal. Ewes will be content to remain scattered on the pasture, which will prevent the congestion and confusion that can cause lambs to stray and get lost. 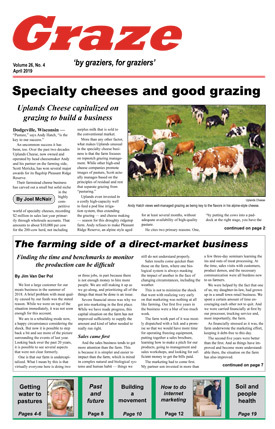 Managing grass goes beyond choosing the right date, to ensuring that the flock will have enough quality pasture. With set-stock lambing, in which the flock or portions of the flock stay in one place throughout lambing, the shepherd needs to correctly judge the required stocking density. With drift lambing, where newly lambed mothers and their offspring stay behind while the rest of the flock moves to a new paddock after a day or a few days, the goal is to move on before the grass gets too short for those that remain. If there is too little feed, a newly lambed ewe will tend to travel to all corners of the paddock searching for feed, dragging her lambs along and increasing the chances they will get lost. Hungry sheep are also less focused on their new lambs. I recently had a reminder of just how important this management is to enhancing the ewe-lamb bond. All had been going well with my drift lambing, and up to that point had only three orphan lambs out the first 100 born (two of those were quintuplets). But then I decided to keep the lambing flock on a paddock for one more day, even though I knew it was getting a bit short. The next morning I returned to see the paddock had been grazed to less than one inch of height, and the entire flock was moving from one end to the other in search of feed. 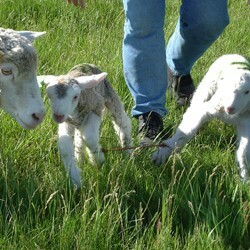 Five ewes had lambed among more than 100 others, and their lambs were scattered all over the paddock. The rest of the flock had pushed close to these ewes, and the newborns were either being lured away, or were having trouble keeping up with their mothers as they searched for feed. Eventually the lambs can become separated and scattered, and the dam can forget how many she has, or gives up chasing the wanderers to concentrate on those that stay put. I spent an hour and a half watching them to figure out what lambs belonged to which ewes. Experience has taught me not to rush in when these things happen, but to sit back and just watch the sheep. Most of the ewes can find their lambs if you give them time. After sufficient observation, I concluded there were three unclaimed lambs. I call them “foundlings.” My rule is to not touch a foundling if it appears to be fed and cared for, but rather wait until it is truly hungry, and then see if anyone comes to claim it. In this case I had a very good idea where the lambs belonged, although both ewes seemed preoccupied with eating and were a bit exasperated about searching for lambs. I moved the drop bunch more diligently after that, and my ewes returned to being good mothers. With no need for anyone to wander, the new mothers were maintaining the 30-foot circle of protection. This little management detail makes all the difference. Even with adequate grass, sometimes there are problems with dams that cannot count very well. Or the lamb can be the problem because it is following everything that moves — even four-wheelers. 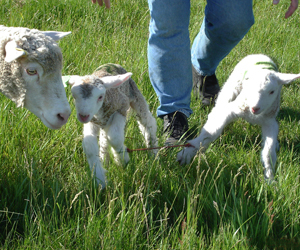 There is a simple little trick that can make life easier in this regard: hobble two lambs together by the front legs using a piece of cord, about 16 inches long. Tie the cord just above the ankle on each lamb, using a square knot so it does not tighten up. They will fight the cord for the first few minutes, but no injuries will result as long as the lambs are evenly matched in size. Hobble them for at least 24 hours, but never longer than 48 hours. It is amazing how lambs tied together become inseparable even after the hobble is removed. If hobbling is required on a regular basis, quite possibly there is something that can be changed to improve bonding. But if it’s more a matter of the occasional problem, this trick can greatly brighten a potentially miserable day.